A Five Keys graduate smiles. Photo courtesy of filmmaker Annelise Wunderlich. 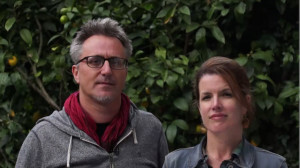 “The Corridor” filmmakers Richard O’Connell and Annelise Wunderlich, who are rounding up funding to finish their documentary of Five Keys high school. Photo courtesy of Annelise Wunderlich. 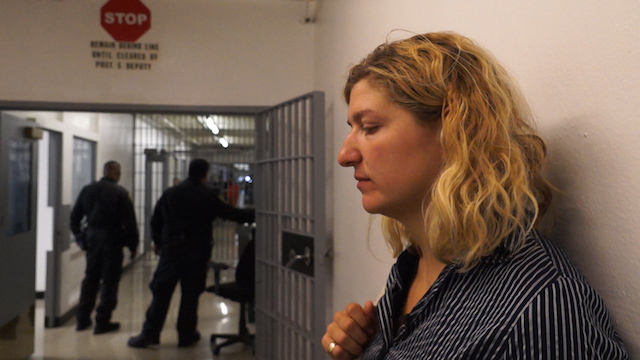 Four years after approaching the subject, filmmakers Annelise Wunderlich and Richard O’Connell feel it’s the perfect time to finish their documentary on the nation’s first adult high school inside a county jail system: San Francisco’s Five Keys Charter Schools. Wunderlich, a Mission resident since 1994, easily lists reasons the time is right for a film on the education experiment — the passage of Prop 47 realigning inmates from prisons to jails, large grants made to improve the criminal justice environment, alleged wrongdoing and bias in the city’s law enforcement, incoming presidential candidate talking points. “I think we’re at a historic moment,” she said. The filmmakers have created a Kickstarter campaign to raise the money for final editing of the documentary they’ve largely self-funded until now, plus a $20,000 grant from the San Francisco Foundation that supported their rough cut. As of today they had reached their funding goal, but still have 29 hours left in the campaign. They hope to release their documentary by fall, they said, so their work can be part of the national conversation on incarceration and recidivism. The documentary, “The Corridor,“ follows a semester in the life of the high school; the ebb and flow of its population and the successes and challenges faced by students and their teachers in a stressful criminal justice environment. Five Keys, founded in 2003 under former sheriff Michael Hennessey, endeavors to reduce recidivism with education. Although measuring recidivism is tricky, the school says its students reoffend at about half the state’s rate of 61 percent. This has earned the school attention — it’s a finalist for an award from Harvard — and an expansion to Los Angeles. The “five keys” the school identifies? Education, employment, recovery, family and community. 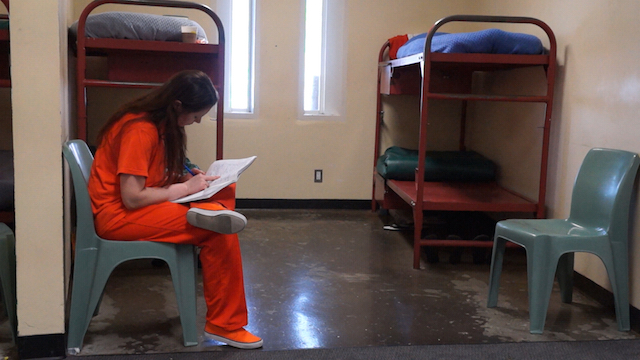 Five Keys student Bethany rediscovered her talent for math while studying in jail. Photo courtesy of filmmaker Annelise Wunderlich. She and O’Connell, who works at ITVS, first proposed to film at the school under founding sheriff Hennessey’s tenure. He said no. “He thought it would be too disruptive,“ said Wunderlich. Still, that permission came with constraints. The filmmakers had equipment and personnel limits, were not allowed to shoot fights or gang materials, entryways or exit ways. That was OK, they said. Neither violence nor policing were the heart of the story. What they did see were officers who were initially cold to the school become more open-minded about its presence. Having inmates occupied with school “makes their jobs easier,” she said. It has also forced the sheriff’s department to adjust its practices, with handling the school and its restorative justice model becoming part of deputies’ training. But the filmmakers’ focus was the corridor’s classrooms: the teachers and their students. Frederick Wiseman’s place-oriented documentaries were an inspiration. Five Keys teacher Kathy Rose. Photo courtesy of filmmaker Annelise Wunderlich. In class, teachers were not to know what their students’ crimes were. Where inmates were stripped of their individuality in custody, “they got that back in the classroom,” said Wunderlich. Sometimes that individuality caused strife — although the filmmakers never witnessed a physical fight. Teachers find themselves in “very parental roles,” said O’Connell. In other cases, students set themselves apart in positive ways, including two of the documentary’s central characters. 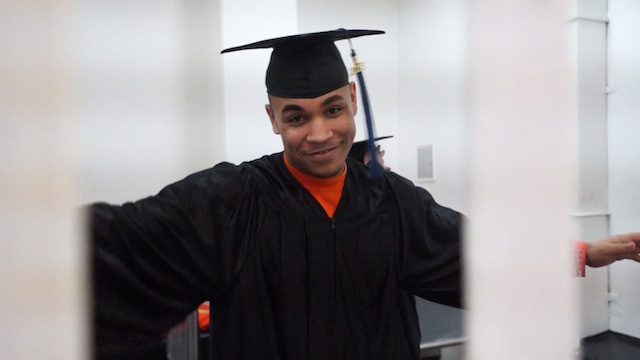 Inmate William did so well in school his 18-year sentence was reduced. Having his performance on camera helped demonstrate that he was ready to leave prison after six years. But if he messes up even once, he’ll be back in jail for longer than his original sentence, said Wunderlich. William’s working three minimum wage jobs, the filmmakers said, and building his relationship with his son. Gearing up for the film’s final editing, Wunderlich is happy to see its Kickstarter being shared by Five Keys teachers. For them, the documentary is a rare opportunity to show their work to those who never see inside a jail. A striking example: teacher Kathy Rose walking the line of the jail’s sixth floor maximum security unit, grading student homework through the cell bars. 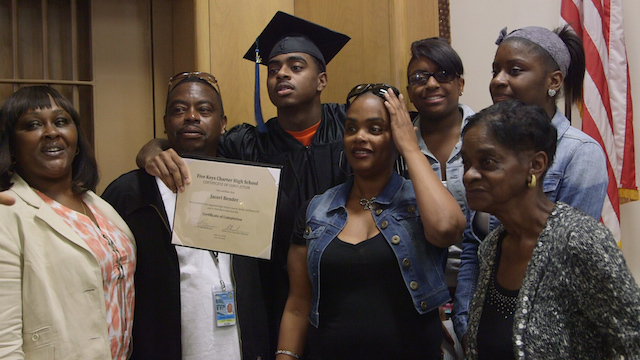 A Five Keys graduate poses with his family. Photo courtesy of filmmaker Annelise Wunderlich. The Kickstarter campaign for “The Corridor” runs until Friday, May 15. PreviousGood Morning Mission from the Nexus of Community, Tech and Design!